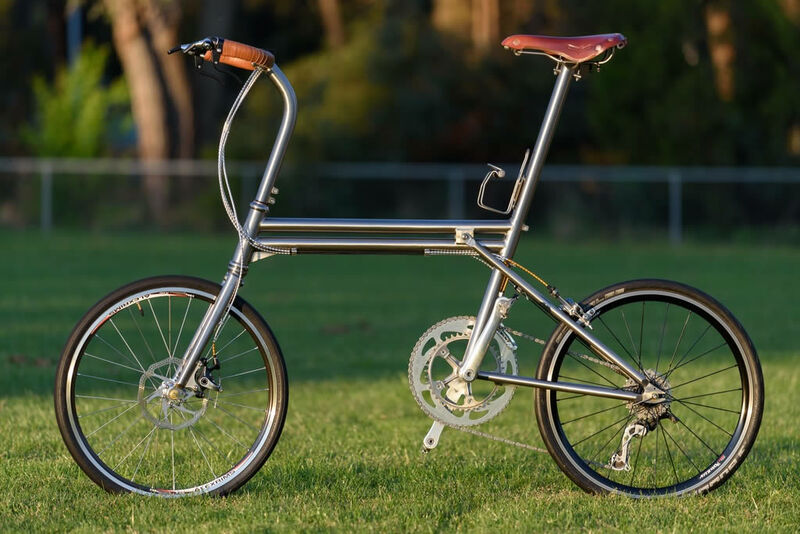 This titanium folding frame is based on the Xootr Swift design, made by request of a customer. Adapted for titanium construction, its geometry has been fine-tuned to improve handling and the frame sports up-to-date features such as a front disc brake. As with the original Swift, removing the seatpost allows the rear triangle to pivot down and forward for easier maneuvering on trains and other mass transit, as well as providing a more compact storage footprint in home or office. The customer also purchased a curved titanium stem riser, two-bolt titanium seatpost and titanium bullhorn handlebars. Subsequent limited production batches were customized with various options including S-curved seat and chainstays, 406 and 451mm wheel sizes, V-brake bosses, rear disc brake mounts, caliper brake bridges and a seatstay coupler to allow the use of a Gates Carbon Drive belt. The frame is now available completely custom with no minimum order.